Bordelaise sauce is a classic French sauce named after the Bordeaux region of France, which is famous for its wine. 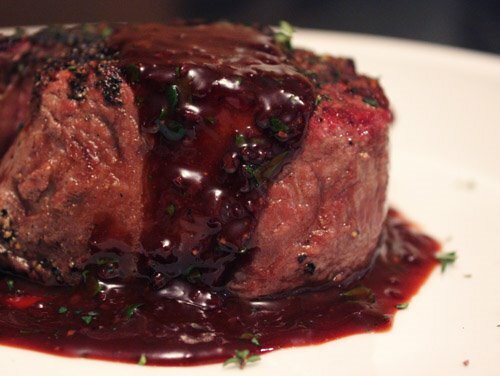 The sauce is made with dry red wine, bone marrow, butter, shallots and sauce demi-glace. Demi-glace is a rich brown sauce in French cuisine used by itself or as a base for other sauces. The term comes from the French word glace, which, used in reference to a sauce, means icing or glaze. For the sauce follow the directions below. Kids will learn to make stock, demi-glace, roux, mirepoix, and ultimately bordelaise sauce. See below for culinary definitions. 1. Boil wine, shallot, mushrooms, carrot, thyme, bay leaf, and peppercorns in a 3-quart heavy saucepan until reduced to about 1/2 cup, about 15 minutes. Add beef stock and return to a boil. Pour through a fine sieve into a 2-quart heavy saucepan, pressing on the contents of the sieve to extract the maximum amount of liquid. Return sauce to a boil. Stir together roux and Madeira and whisk into sauce. Simmer, whisking occasionally, until slightly thickened, about 2 minutes, then stir in salt and season with pepper. 1. Rinse marrow bones and soak in warm water to cover 10 minutes. Press on 1 bone with your thumb at end of bone with smaller opening, pushing marrow out other end. Discard bone and repeat with remaining bones. Cut marrow crosswise into 1/8-inch-thick rounds. Cover marrow with cold water in a bowl and chill, changing water twice, 24 hours. 1. Melt the butter in a saucepan over low heat, being careful not to let it brown. Cook for about 4 minutes, keeping in mind that the resulting roux should be golden in color. 1 Preheat the oven to 400 degrees. Place the bones on a roasting pan and roast for 1 hour. Mix the mirepoix with the tomato paste and cover the bones with the vegetables. Return to the oven and roast for 45 minutes. Place the pan on the stove and deglaze with the wine, scraping the bottom of the pan for browned particles. Put this mixture in a large stock pot. Add the peppercorns, garlic, and herbs. Season with salt. Bring the liquid up to a boil and reduce to a simmer. Cook for 4 hours more. Remove from heat and skim off any fat of coagulated blood particles that has risen to the surface. Strain the liquid and discard the bones. 2. Return the liquid to the pot and bring to a boil to reduce in volume by ½ . Set aside ½ of the beef stock for later. You now have demi-glace, demi meaning half, and glace meaning glaze. Mirepoix A mirepoix is a mixture of chopped celery, onions, and carrots. Stock is a flavored liquid preparation. It forms the basis of many dished, particularly soups and sauces. Making stocks involves simmering animal bones and/or meat, seafood, or vegetables in water and/or wine, adding mirepoix or other aromatics for more flavor. Demi-glace is a rich brown sauce in French cuisine used by itself or as a base for other sauces. The term comes from the French words demi, meaning half and glace, which, used in reference to a sauce, means icing or glaze. Roux is a substance created by cooking wheat flour and fat. It is the thickening agent of three of the mother sauces of classical French cooking: béchamel sauce, velouté sauce, and espagnole sauce. Deglaze dilute meat sediments in (a pan) in order to make a gravy or sauce, typically using wine. You are welcome. I hope you do try a few recipes.